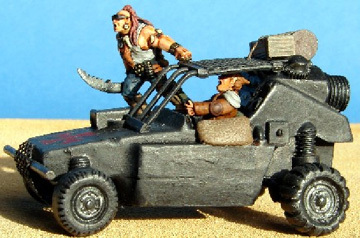 Now that the scavengers had a big tanker to ride on, it seemed only right for the savages to get some wheels and give chase. 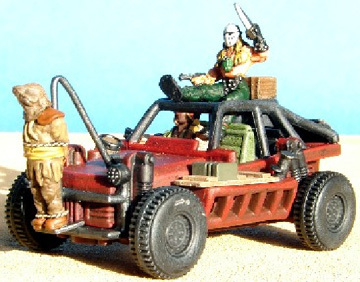 First up is an old Grenadier vehicle. I added a crude bumper from plastic rod and a car repair mesh sump guard. 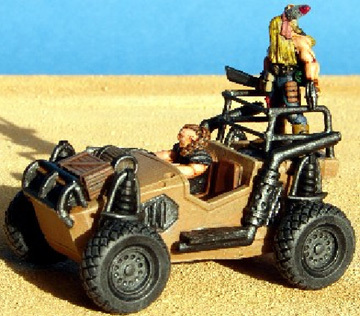 A roll cage for the driver was made from a piece of model fencing and more repair mesh. Assorted junk was added from my bits box. I made a driver from green stuff using a spare head I had hanging around. The outrider (model 0024) had his base removed and left arm repositioned so that it looked like he was hanging on. 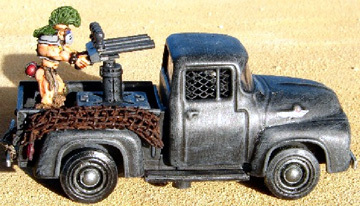 Next was a bit of mobile fire support using a cheap plastic 1950’s style pickup (made in China by Smart Toys). The cab interior was accessible by unscrewing the toy which let me repaint the interior and add another scratch built driver. The multi-barrelled dart gun was built from thin copper pipe, cut up ship model balustrades and a few bits from the spares box. The gunner is figure 0025 with his weapons removed and arms repositioned. A few minor odds and ends added and a quick repaint finished the job.